Def Leppard and KISS played show 9 of their Summer Tour 2014 last night in Los Angeles, CA and here are the setlist statistics. 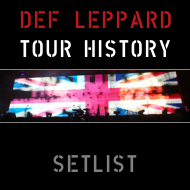 The show took place at The Forum with 13 full songs played by Lep. 'Rocket' was not played at this show. View all the stats below after nine shows. The next show takes place on 9th July in Phoenix, AZ. 13 full songs played and one snippet. 13 of these songs were played at the last San Diego show in September 2011. 'Let It Go' was last played here in October 2006. This was the second indoor arena show of the tour and Leps first time at the venue since 30th December 1992. 13 songs played from four studio albums/one compilation album.